ALL SALES REFUNDS WILL BE REFUNDED AFTER ORDER IS PROCESSED. #A149 Primitive Stitchery with Buttons and Primitive Wooden Frame "Having a friend is a comfort that can never be taken away." 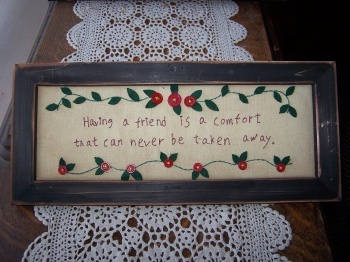 Primitive Stitchery Picture,"Having a friend is a comfort that can never be taken away." 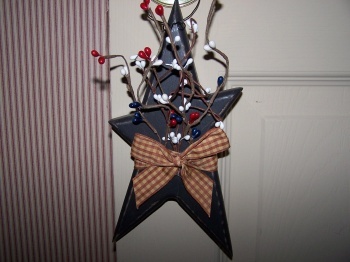 has�brick red�buttons and green felt sewn for the�flowers and leaves. Measurements are 7"x 16". Please click on picture to see larger image. #A152 Primitive Wooden "Fresh Eggs!" Arrow Sign! 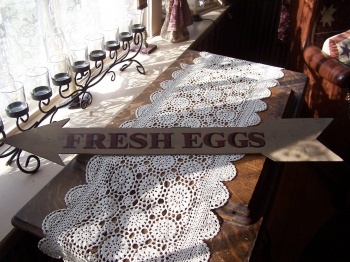 Primitive Wooden "Fresh Eggs!" Arrow Sign. Measures 4 1/8" wide at widest point, 29 3/4" long. Please click on picture to see larger image. 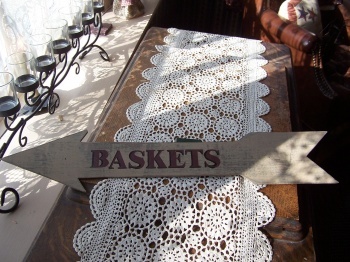 #A153 Primitive Wooden "Baskets!" Arrow Sign! Primitive Wooden "Basket!" Arrow Sign. Measures 4" wide at widest point, 23 3/8" long. Please click on picture to see larger image. 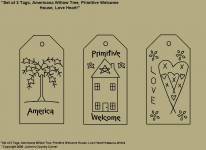 #A307 Primitive Stitchery Patterns, "Set of 3 Primitive Tags, Country Tree, Star Snowman, Birdhouse! Patterns! 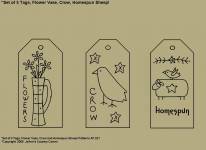 Primitive Stitchery Patterns, "Set of 3 Primitive Tags,�Country Tree, Star Snowman, Birdhouse!" Patterns. Tags measure 2 1/4" x 4 1/2". 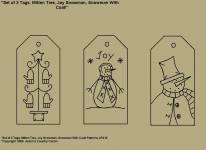 #A308 Primitive Stitchery Pattern, " Set of 3 Primitive Tags, Mitten Tree, Joy Snowman, Snowman with Coat!" Patterns! Primitive Stitchery Patterns, "Set of 3 Primitive Tags, Mitten Tree, Joy Snowman, Snowman with Coat!" Patterns. Tags measure 2 1/4" x 4 1/2". 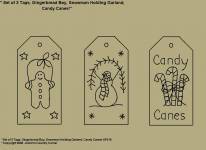 #A309 Primitive Stitchery Patterns, "Set of 3 Primitive Tags, Gingerbread Boy, Snowman Holding Garland, Candy Canes! Patterns! Primitive Stitchery Patterns, "Set of 3 Primitive Tags,Gingerbread Boy, Snowman Holding Garland, Candy Canes!" Patterns. Tags measure 2 1/4" x 4 1/2". 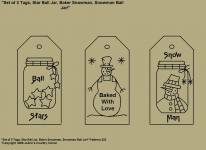 #A310 Primitive Stitchery Patterns, "Set of 3 Primitive Tags, Star Ball Jar, Baker Snowman, Snowman Ball Jar!" Patterns! 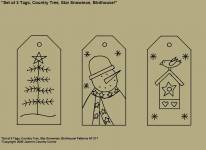 Primitive Stitchery Patterns, "Set of 3 Primitive Tags, Star Ball Jar, Baker Snowman, Snowman Ball Jar!" Patterns! Patterns measure�2 1/4"x�4 1/2". 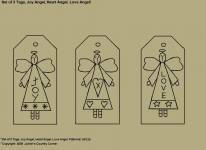 #A311 Primitive Stitchery Patterns, "Set of 3 Primitive Tags, Raggedy Andy, Raggedy Annie, I Love Raggedy Dolls!" Patterns! 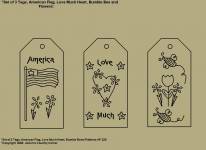 Primitive Stitchery Patterns, "Set of 3 Primitive Tags,Raggedy Andy, Raggedy Annie, I love Raggedy Dolls!" Patterns! 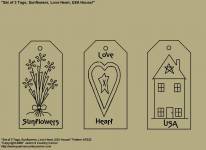 Patterns measure�2 1/4"x�4 1/2".